The President — not only has there been tension on a personal level, but the president has undercut and clashed with Tillerson over key policy issues like Qatar, North Korea and Iran.Recall a few weeks ago when we reported Trump was growing increasingly frustrated with Tillerson, telling colleagues: "Rex just doesn't get it, he's totally establishment in his thinking. "The White House didn't challenge our report and ultimately issued the blandest statement — from a spokesperson, not Trump — in support of Tillerson. The State Department rank-and-file — a typical story about their rock bottom morale, here, and about the department's dysfunction, here. The White House — this goes well beyond the National Security Council. Tillerson's Chief of Staff Margaret Peterlin has accumulated an astonishing number of enemies across the administration.The exchange of "Margaret stories" — including the time she reportedly vetted Condoleezza Rice's request for a phone conversation with Tillerson — has become a frequent topic of conversation among administration officials who've dealt with her. Capitol Hill — Republicans repudiated Tillerson's proposed funding cuts and straitjacketed his organizational proposals. Democrats, well, just read this blistering letter from Sen. Ben Cardin, ranking member of the Senate Foreign Relations Committee: "If the State Department were a private company, it is hard to imagine that it would be allowed to operate for the better part of a year, and maybe longer, without critical senior management. "Last week, the Washington Free Beacon reported there were tensions between the State Department and both the White House and key Republican senators, including Tom Cotton, over whether Israel should return $75 million in U.S. aid to comply with an Obama era agreement.Tillerson's spokesman R.C. Hammond categorically denied the report: "The conversations are figments of somebody's imagination." I asked the White House and Capitol Hill sources close to the issue whether they'd corroborate Hammond's statement. Radio silence. The media — Tillerson got off to a bad start, by breaking with precedent and refusing to allow the press corps to travel with him. How did Tillerson get into this mess? We've spoken to 17 sources inside the White House, on Capitol Hill, in the State Department and among leaders of the foreign policy community. A former top Bush administration official sums it up most pithily: "He's got no support from the left on management and no support from the right on policy." 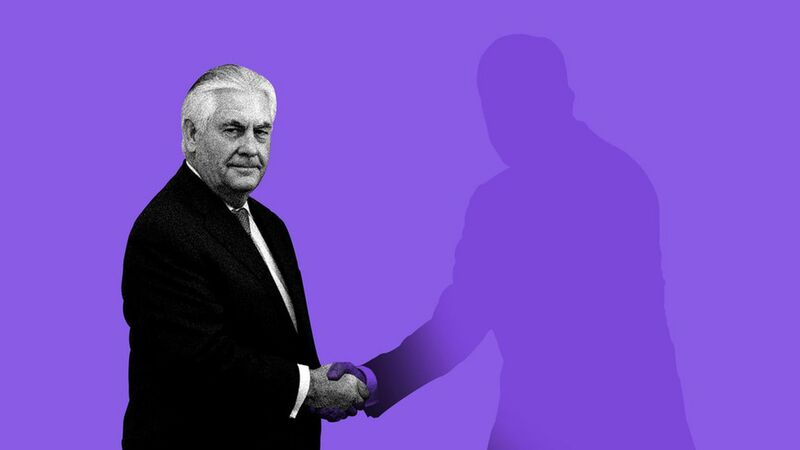 What the official means: Tillerson alienated his natural constituency — moderates who view him as a restraining influence on Trump — by what he's done, or failed to do, managerially at the State Department. He's surrounded himself by a tiny circle and hasn't sought much advice from outsiders. And he's got no ideological constituency on the right because he doesn't embrace the forward-leaning posture on human rights, or the aggressive stance on Russia, that Republicans typically expect of their top diplomats. With the media, Tillerson simply didn't try. The New York Times' influential foreign policy columnist Tom Friedman told me he twice asked Tillerson's spokesman whether he could come in for a briefing. He said he was ignored both times. "When I want to think about or discuss U.S. foreign policy today I go to people in the Pentagon," Friedman said. In Tillerson's defense: Struggling to find influential figures willing to publicly defend Tillerson, I reached out to Tillerson's spokesman, Hammond. He connected me with John Hamre, the president of the Center for Strategic and International Studies, on whose board Tillerson served. Hammond also shared this supportive tweet and this supportive column co-bylined by James Jay Carafano, a top foreign policy expert at Heritage. He also shared a Bloomberg column, praising Tillerson's long-standing commitment to racial diversity; a New York Times editorial commending Tillerson's apparent evolution on human rights advocacy; and a rare positive statement from Marco Rubio, a harsh critic of Tillerson's. Strategic thinker: Sen. Bob Corker, chairman of the Senate Foreign Relations Committee, told me: "I believe that he is a strategic thinker who is trying to think through not just the next step but several steps beyond that so that our nation will be best served." Quiet relationship-builder: Hamre says a number of heads of state have personally told him Tillerson has restored confidence about their relationships with the U.S. He points to South Korea, China, and Japan as three countries with which Tillerson has been "quite instrumental" in building constructive relationships. "You have to remember, Mr. Bannon was waging war against China. It was Secretary Tillerson that was able to help structure a much more constructive relationship with China." Restraining influence on Trump: Sources close to the White House point to Tillerson's relationship with Mattis as crucial to keeping Trump on an even keel and restraining him from his most reckless impulses. He's "changing": A House GOP aide told me that after a very slow start, Tillerson has begun to get serious about outreach over the past two-three months. He's having breakfasts and calls with key members, and his staff is facilitating briefings for staff with top officials. "It's a move in the right direction," the source said. Hamre points out that Tillerson spent his whole career in private industry, where it didn't make business sense to "engage the press on the press's terms." Hamre says Tillerson came into the Secretary of State role "without the understanding of the role that the popular media plays in his job. I think he has been changing. Now, he's not changing to the speed that all of you guys want. But he is changing." Bottom line: Tillerson appears to be making a belated effort to become a public figure and do the normal outreach and human rights advocacy expected of his role. We'll learn soon enough whether he's left it all too late.